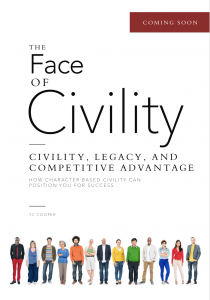 Publishing, a niche publishing company with a focus on promoting and publishing books on civility and social competence-related topics is pleased to announce the release of THE FACE OF CIVILITY – the book is a compilation book where a collective of experts in their fields share their stories of civility. Author TC Cooper is a best-selling author, keynote speaker, business coach, and an attorney. She has a significant legal career that started with her being a private equity attorney at a large international law firm headquartered in New York City, and then providing expert legal counsel as in-house counsel for a publicly traded luxury watch brand, and then in government. TC has been seen in publications that include Black Enterprise Magazine, California Bar Journal, New Jersey’s InBiz Magazine, the National Speaker Association’s Speaker Magazine, Productive Business Network, and the Washington Lawyer Magazine. TC Cooper writes about Sustainable success flows when character-based civility penetrates every aspect of business from negotiations in the board room, to hiring practices in human resources and workforce development, and in the day-to-day running of businesses. The impact of undervaluing character and civility in business. “The Face of Civility” is a series of collaboration books by change-makers around the globe. The books are part of The Golden Rule Civility Initiative, which is co-created by Canadian Dr. Lew Bayer and American Dr. Clyde Rivers. Dr. Rivers and his team have collaborated with Dr. Lew Bayer, CEO Civility Experts Worldwide, and her team – recognized around the world as the leading experts on civility – to create a solution for interrupting the incivility and shifting uncivil discourse going on in our societies. Enter your contact details below to be among the first to learn when this powerful new book is available to the public.